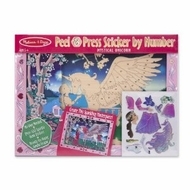 A princess, a unicorn, and sparkling gem-like stickers are the magic ingredients in creating this enchanting scene. Simply follow the number key and put the stickers in their places. Once complete, this sparkling picture is ready to hang on your wall.